The first Ford Ka models were produced in 1996 and made an immediate impression. Not everyone liked its bold and unique styling but there was no doubt that this was an interesting new addition to the Ford range. The early reviews of the Ka generally praised its handling and value for money. The first generation Ka was brought out as a single model, with a few different manufacturer extras possible. In terms of different models, the StreetKa and SportKa were introduced in 2003. The popularity of the first model was shown in the fact that it stayed in production all the way through to 2009. At this point, the second generation Ford Ka was introduced to the world, following a decade of only minor changes to the car. The second generation Ka went on sale officially in 2009 and sported a more modern look and a number of enhancements to the driving experience, such as optional Bluetooth functionality and voice control. The third generation Ka has recently been revealed and details of its worldwide release dates are expected soon. 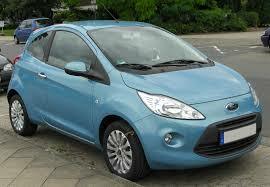 The low cost of buying one is a huge advantage when it comes to choosing a Ford Ka. Even if you buy a brand new one with 0 miles on the clock it won’t set you back too much, while the thriving second hand market offers a lot of cheap deals on older models. It is also a fun car to drive, with decent handling and a nippy enough approach for getting around the city streets. The most recent models also come with a surprising amount of technology that makes driving easier and more fun than you might expect in such a small car. Running costs for the Ka are also pretty low, with fuel and tax being areas you won’t need to spend a fortune on. The first thing you will notice if you get a few quotes on Ka models from different years is that the insurance group is lower for the second generation cars produced from 2009 onwards. The first generation models made before this date tend to be around the insurance groups ratings 10-11, with the SportKa models coming in at around group 15 and 16. The newer models are cheaper to insure, with many of them falling into insurance group 3 and some fall into 4 or even 2. This means that the lower insurance costs might make it worth your while getting a more modern Ka that costs a little more, although you will want to work out all the figures before you make your final decision, of course. The Ford Ka is an excellent city that offers good value for money and a decent ride. The fact that it is cheap to run and reliable means that it is the type of vehicle that can come in handy for a number of different types of use, such as for commuting, for the school run or for use as a second car to use around town.